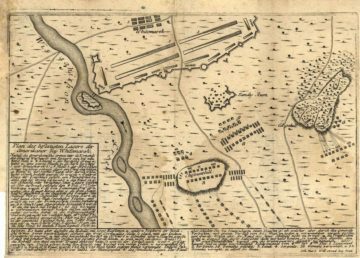 The Battle of White Marsh (aka Battle of Edge Hill) was a battle fought in the area surrounding Whitemarsh Township, Pennsylvania. The battle, which took the form of a series of skirmish actions, was the last major engagement of 1777 between British and American forces. General George Washington spent the weeks after his defeat at Germantown encamped with the Continental Army in various locations throughout Montgomery County, just north of British-occupied Philadelphia. In early November, the Americans established an entrenched position approximately 16 miles north of Philadelphia along the Wissahickon Creek and Sandy Run, primarily situated on several hills between Old York Road and Bethlehem Pike. From here, Washington monitored British troop movements in Philadelphia and evaluated his options. On December 4, General William Howe, the commander-in-chief of British forces in North America, led a sizable contingent of troops out of Philadelphia in one last attempt to destroy Washington and the Continental Army before the onset of winter. After a series of skirmishes, Howe called off the attack and returned to Philadelphia without engaging Washington in a decisive conflict. With the British back in Philadelphia, Washington was able to march his troops to winter quarters at Valley Forge. Armies - American Forces was commanded by Gen. George Washington and consisted of about 11,000 Soldiers. British Forces was commanded by Gen. William Howe and consisted of about 14,000 Soldiers. Casualties - American casualties were estimated to be 90 killed/wounded and 32 missing/captured. British casualties was approximately 19 killed, 60 wounded, 33 missing, and 238 deserted. After their defeat at Germantown, Washington's army retreated along Skippack Pike to Pawling's Mill, beyond the Perkiomen Creek, where they remained encamped until October 8. They then marched east on Skippack Pike, turned left on Forty-Foot Road, and marched to Sumneytown Pike, where they camped on the property of Frederick Wampole near Kulpsville in Towamencin Township. On October 16, Washington's forces marched to Methacton, one group via Forty-Foot Road and Skippack Pike, the other on Sumneytown Pike and North Wales Road. On October 20, they marched down Skippack Pike to Whitpain. On November 2, Washington marched his forces—one column via Skippack Pike and the other on Morris Road and present-day Pennsylvania Avenue—to White Marsh, approximately 13 miles northwest of Philadelphia. In early December, Howe decided to make one last attempt to destroy Washington's army before the onset of winter, and he began preparations for the attack on the American forces who were rumored to be in the process of moving to a new camp. Washington's intelligence network, led by Major John Clark, became aware of British plans to surprise the Americans, through a Quaker housewife named Lydia Darragh. The Continental Army was ready when Howe marched out of Philadelphia, with a force of approximately 14,000 men, at midnight on December 4. The advance column, led by Lieutenant General Charles Cornwallis, headed up Germantown Pike. A second column, led by Major General Wilhelm von Knyphausen, marched toward the American left. Washington and his men are itching for a fight. Washington, who has heard grumbling from Congress after losing two major battles and the city of Philadelphia in 3 months, would like nothing better than one more dance with Howe. Washington's soldiers would like nothing better than a chance to take out their frustrations on Howe's Redcoats. It is the first week of December. The Continental Army, encamped for the last month at Whitemarsh, 13 miles northwest of Philadelphia, is waiting for an attack that Washington's spies have assured him is coming. Dug into heavily wooded hills, the Continental troops are in an ugly mood. They are cold, hungry, and tired. And they haven't been paid since late summer. They occupy fortified high ground, a circumstance that fosters feelings of invulnerability. The night sky has convinced some American soldiers that a big battle is coming. A bloody battle is, indeed, what Howe has in mind, as he marches nearly his entire army - about 12,000 British and German troops - out of Philadelphia late on the bitterly cold night of December 4th, leaving only 3,000 troops behind. Hoping for a decisive victory (or at least to push Washington's army back so British troops can safely venture outside the city on foraging expeditions), Howe means to make one last attack on the Continental Army before winter closes in. Howe has had two strategic goals in 1777. He achieved one when his army occupied Philadelphia at the end of September. The other, destroying Washington's army, has eluded him, even though he defeated the Americans at the Brandywine and Germantown. Both Howe and Washington are operating in the shadow of the devastating British defeat at Saratoga. Howe knows that he may be criticized for not doing more to assist Lieutenant General John Burgoyne, the vanquished British commander, in Burgoyne's invasion of New York from Canada. Howe has already offered his resignation to the ministry in London, complaining that the ministry has not given him enough manpower. Washington, too, is watching his back. Some in Congress and the army have begun whispering about his leadership, particularly Brigadier General Thomas Conway, a French citizen of Irish birth serving in the Continental Army. Conway believes that Major General Horatio Gates, the victor of Saratoga, should replace Washington as commander-in-chief. While Washington is irked by the criticism, he hasn't let it affect his judgment. With his customary desire to see things for himself, he has left his headquarters to scout the British defenses of Philadelphia. Washington finds the British fortifications, running from Kensington on the Delaware River to the Upper Ferry on the Schuylkill, "much stronger than I had reason to expect for the accounting I had received." An attack on Philadelphia is out of the question. How fortunate for Washington, then, that Howe has decided to come to him. So eager is Washington to entertain Howe that he pronounces himself on December 1 "disappointed" that the British have not yet attacked. Howe and his officers have done their best to keep the impending attack a secret, but the British preparations have not escaped the notice of sharp-eyed Philadelphians, who have passed on the information to Washington's spymasters. On December 4, after drawing 6 days' rations, the British march out of Philadelphia at midnight. When they show up just outside Chestnut Hill in the predawn hours, the Americans - about 15,000 strong, including reinforcements from Gates' army, are awake and waiting for them. Washington orders the Pennsylvania militia on his right flank forward "to skirmish with their Light, advanced parties." 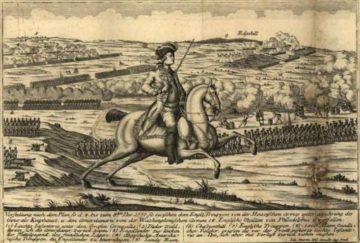 The fight is short and fierce; the militia commander, General William Irvine, is captured, and the Pennsylvanians retreat. The action opens three days of maneuvering, as Howe's troops move back and forth across the American front, keeping about a mile away, looking for an opening. Behind their lines, the Americans shadow the British feints, denying Howe any point of attack. As Howe's soldiers march and counter march, they take out their wrath on the civilian population, burning houses as they go. On December 6, Johann Ewald, a German officer serving with the British, describes the scene of the night as the army burns houses in the villages of Cresheim and Beggarstown: "The sight was horrible. The night was very dark. The blazing flames spread about with all swiftness and the wind blew violently. The cries of human voices of the young and old, who had seen their belongings consumed by the flames without saving anything, put everyone in a melancholy." Even American opponents of the war are aghast. Robert Morton, a teenage Quaker from Philadelphia, writes in his diary that the soldiers "committed great outrages on the inhabitants... as if the sole purpose of the expedition was to destroy and to spread ruin and desolation, to dispose the inhabitants to rebellion by despoiling their property... . "
On December 7, Howe makes one last effort to turn the American left flank by way of Abington and Edge Hill, a ridge that runs parallel to the American lines. Washington quickly counters with Colonel Daniel Morgan's rifle corps and Maryland militia. The Americans retreat after some sharp fighting, but the British also pull back. 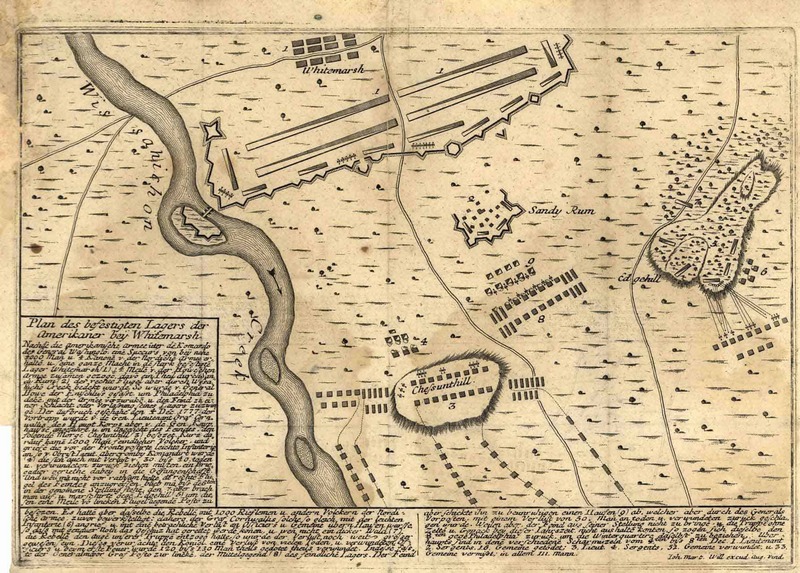 Small-scale fights, known collectively as the Battle of Edge Hill, go on throughout the day in the thick woods, but no full-scale battle develops. Washington is disappointed. "I sincerely wish, that they had made an Attack," he writes to Congress. "The Issue in all probability, from the disposition of our Troops and the strong situation of our Camp, would have been fortunate and happy." 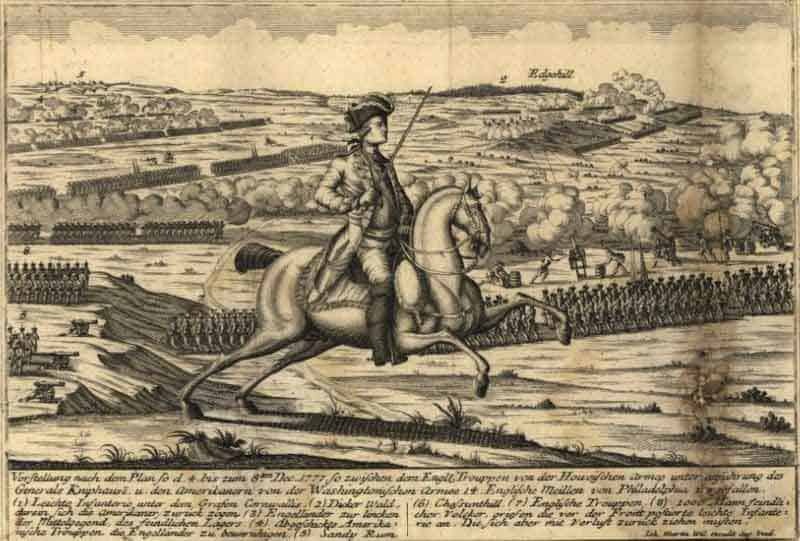 On December 8, Howe, realizing he can neither outflank Washington nor draw him into the open, marches back to Philadelphia. On December 11, the Continental Army left White Marsh for Valley Forge. The following April, Howe resigned his post and returned to Britain, and was replaced by General Henry Clinton. Following France's entry into the war, the British evacuated Philadelphia overland the following spring, and while en route to New York City, they were attacked by Washington at the Battle of Monmouth.